Iridium Communications' fifth set of 10 Iridium NEXT satellites, launched last Friday by SpaceX, are functioning nominally and have started the testing and validation process — this fifth launch increased the total number of Iridium NEXT satellites in space to 50, and was also the second Iridium NEXT launch to use a flight-proven Falcon 9 rocket. The Iridium constellation is comprised of six polar orbiting planes, each containing 11 operational cross-linked satellites, for a total of 66 satellites in the active constellation. 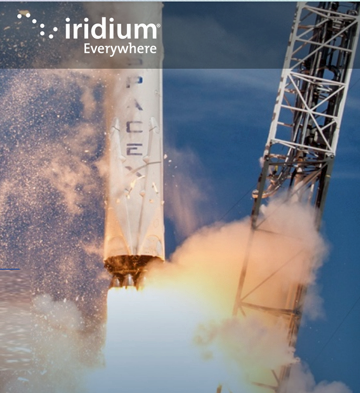 This unique architecture creates a web of coverage around the earth, enabling Iridium to provide real-time communications over the oceans and from even the most remote locations. Three more Iridium NEXT launches are scheduled for 2018, to bring Iridium's total to 75 new satellites in orbit, including nine spares. Scott Smith, the COO at Iridium, said that once testing is complete, the company will be just 25 Iridium NEXT satellites shy of completing this historic tech refresh. It's inspiring to think about how Iridium is doing this for a second time and no one else has accomplished a feat of this magnitude in space — even once. Tests and diagnostics began just minutes after the new satellites deployed, and all systems are functioning nominally.